rested at the stage of “Saint Kolbe”. For the Catholic Church has a shameful anti semitic past that excludes it from any rights over the former camp. I shall give but one example among so many others, this one found by chance in a book published in 1898 that was distributed widely among our “dear little blond children” sitting well behavedly on the school benches. This is the work by Charles Hermeline, “A travers l'Europe”. I have taken a passage (pages 301 to 303) concerning his visit to Cracow [Photos 42, 43 and 44]. Read it carefully, bearing in mind that Hermeline was a French priest, and a schoolteacher to boot. You will say that it is very old, and that mentalities have changed since then. I don't deny it, but out of curiosity I calculated the age an adolescent of 15, open and receptive in 1898, hence born in 1883, would have had in 1940. He would have been 57, a man at the summit of his life, in all the power of his maturity. I looked [it must be admitted with an idea at the back of my mind] in the encyclopedia... “Laval (Pierre), French politician, born at Châteldon, Puy de Dôme, in 1833”. No comment. The Catholic Church has no business to be in Auschwitz, a place of international and atheistic sorrow par excellence. Dozens of different nationalities were represented there. A little over one million people of the Jewish faith, the great majority of them women and children, were exterminated there(1). And this because of texts such as that written by the “good priest” Hermeline. The Jewish predominance in Auschwitz Birkenau should therefore be absolute, though without neglecting the others, simply because of the weight of their number of dead. Canonizing Kolbe is almost an insult to the million Jewish victims, even if it has a beneficial effect on the Polish people. What would practicing Christians say if the title of “Saint” were to be accorded to all the direct participants in the extermination, they who reached the absolute limits of horror? The extra temporal planet of Auschwitz Birkenau can but be a place for profound reflection on the essence of man, untrammeled by absurd religious beliefs. In 1979 I had gone to Auschwitz to try to find the executioners' motivations, their attitudes, their thoughts when confronted with the machinery of death that they had organized “on orders from above” [I was continuing the experiment begun by Robert Merle in his “Death is my trade”]. Trained as an officer, I was supposed to know the limits of “orders”. Technically, I wanted to know exactly how the “mills” of Auschwitz were organized and the details of their inner workings. I must admit that I scarcely gave a thought to the victims, not even knowing that the majority of them were women and children. Jews, apparently. What did it matter, I knew none and a good deal of the literature available up to 1945 stated in all manner of ways that they should be thrown out because they, the “cosmopolitans”, were destroying our “old France” that belonged to us, Chauvinist French patriots. As I was working on Birkenau, I was obliged to meet these famous Jews. In the end, it was not the Hoess autobiography or the archive documents, the drawings, the original photographs or the ruins of the Krematorium that turned my initial ideas inside out, but the modest and simple testimony of Mr. Zylbermine, as he told me his story in detail during a whole afternoon. For him, it was very painful. As for me, I could never be the same again. He succeeded in injecting his memories, which I now carry in myself. I had the impression of lifting the lid of the cauldron of Hell, a thing I am in no hurry to do again. Everything was recorded on tape at the wish of Tadeusz Iwaszko, but unfortunately this tape, with its so moving contents, went astray in Poland during a baggage transfer between airports. I shall never write about Mr Zylbermine's concentration camp experience. 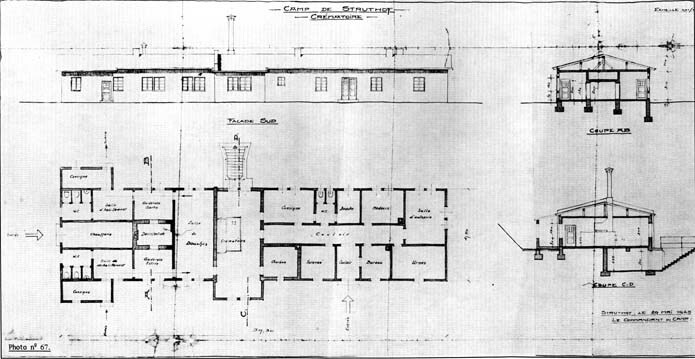 Although I accepted the truth of his account from the outset and with no discussion except to ask him for more detail on certain points, I nevertheless found confirmation of an episode where his life hung by a thread in the Gleiwitz camp thanks to the account by Father Robert Waitz on the evacuations of January 1945 in “De l'université aux Camps de Concentration”. Just as I was completely open to the memories of Mr. Zylbermine, so I doubted the verbal declarations of David Olère, though I totally accepted his pictorial testimony. The monstrosity of Olère's life in Krematorium III was simply not transmissible. It was neither his fault nor mine. A profound and confident communication such as I enjoyed with Mr. Zylbermine, was impossible with David Olère, because although I could precisely materialize the physical environment of his life, I was incapable, through fear, of intellectually concretizing the demential life itself. (1) 1,352,980 for G. Wellers : between 1,050,000 and 1,100.000 for R. Hilberg.